Sometimes you need something a little special for the job in hand. Our unique configurator will help us help you to customise a portable mobile power distribution solution for your application. It's fast and easy to use, covering everything from enclosure and frame materials to incoming supply and outgoing protection. All you have to do is tick the right boxes and we'll do the rest. 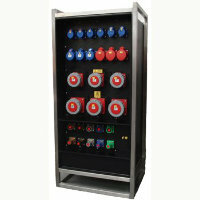 Solutions range from Portable free standing / Frame mounted / Wall mounted or even 19-inch Rack. 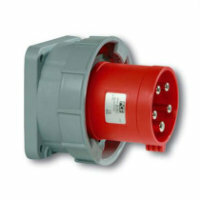 With incoming power options of 16A/32A/63A/125A/ or 400Amp in either Single Phase or 3Phase available in a number of robust, durable materials. 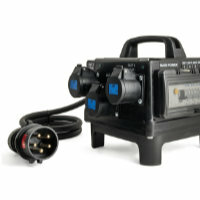 Plus, our custom products are tough, safe, long lasting and deliver power where and when you need it. In addition every bespoke distro is fully tested by NAPIT approved electricians to ensure compliance with BS7671 (all certificates supplied) for your complete peace of mind. 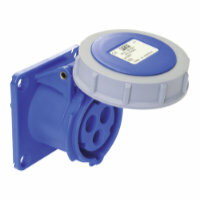 All supplied with 12 months warranty. Get started below for a free quotation or to request a call with our technical team. Choose from one of our four standard materials, select the one of your choice and then continue to build your distro box.. Manufactured from 300-grade medium density black polypropylene (thermoplastic) sheet and of a fully welded construction, available in many sizes. 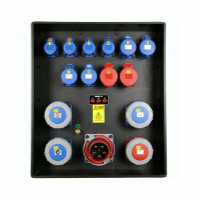 Solid Butyl Rubber enclosures available in a variety of sizes, mainly used for smaller hand held Distro boxes, maximum size 12 modules. Polypropylene boxes with Stainless Steel Frame, manufactured from 9mm Textured Polypropylene (thermoplastic) sheet and of a fully welded construction. Polypropylene boxes with Stainless Steel ( Brushed Finish ) Frame, manufactured from 9mm Textured Polypropylene (thermoplastic) sheet and of a fully welded construction. Choose from one of our four standard enclosure types, select the one of your choice and then continue to build your distro box. 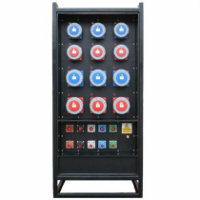 Suitable for indoor or outdoor use, with handles, stackable. All switchgear protected by hinged polycarbonate windows to allow access for operation and inspection of protection devices. Metal or Thermoplastic wall or portable boxes, Over 80 popular configurations are available, pre-assembled off - site, making installation quick and easy. 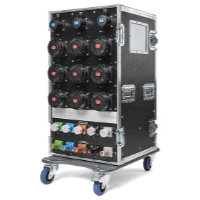 19 Inch Rack Case Line boxes from 32A to 400A built in a 4U to 29U rack with optional lids, front and back, skates with wheels and breaks for ease of mobility. Corporate identity also available. 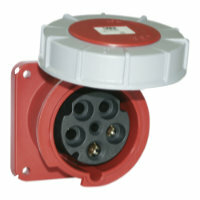 Efficient and reliable 19" AC mains distribution, cases made from 3mm extruded aluminium fronts and steel back boxes. 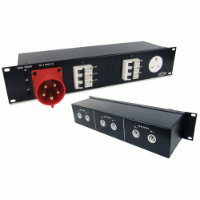 2U and 3U as standard, built to order options available. 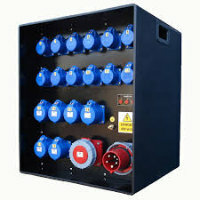 This configurator tool is simply a guide to what is possible as a bespoke power distribution box. Once our engineering team has evaluated your request, we will come back to you with a quotation that we believe is the correct solution. We will base this information upon your configuration request however, we reserve the right to add the relevant protection, if and where required. 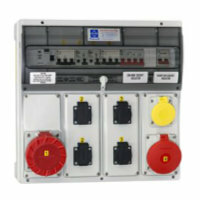 All quotations will conform to BS7671 18th Edition wiring regulations. If you’re happy with your selection, please scroll up and click the "Get quote" button on the right hand side. We would expect to be back to you within 24 hours with a full quotation.